Yes, you guessed it: besides the red garments I also have a thing for red accessories at the moment. But that is probably pretty obvious since this is the third outfit in the last two weeks when I'm wearing this pair of sandals 😀 Though luck, you have to get used to it. But leaving the joke aside, green and red look so great together and they complement each other perfectly so I just had to wear some red accessories to this gorgeous SHIRT with green stripes. It made its way into my closet together with the two-piece set you saw in my previous post and I'm utterly in love with it! 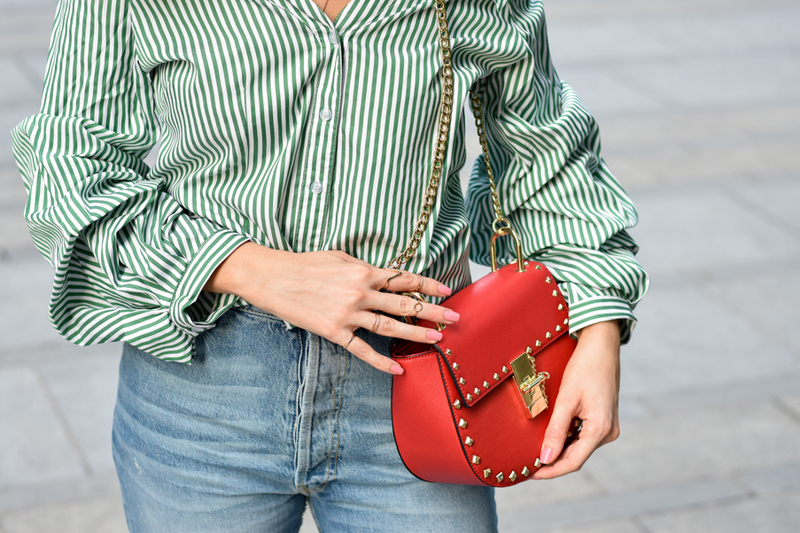 This is the first shirt with green stripes I ever owned and I never thought it would look so amazing in so many combos or that it would be so pretty to wear this season. 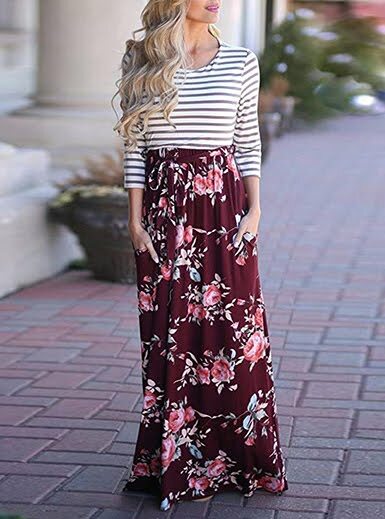 Besides this, I love its style, the off the shoulder detail and the big, poofy sleeves, not to mention the quality of the fabric which is just great! I just wish I would have gotten my normal size instead of a size bigger as it is a bit large for me, but that's fine, I found some ways to pull it off quite easily. 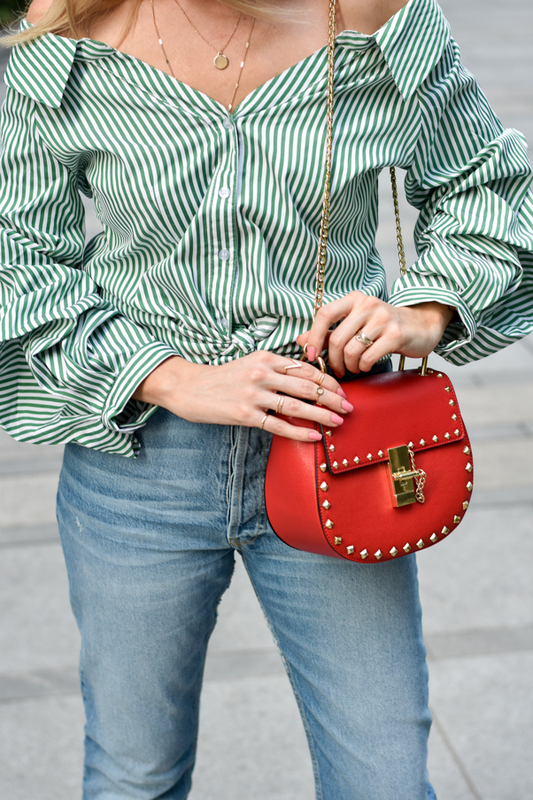 I also must admit that I've been wearing it several times already since I got it and it is truly my favourite piece right now: with jeans and red accessories, just like in the photos, with white trousers and black and white accessories (like in my Instastory posts) and even with shorts. The shirt is very versatile and it has a unique design which will make your outfits look stunning. You can check it out HERE and I found it in blue as well, click HERE. Do you like this type of shirts or do you prefer the classic ones? P.S. : Just so you know, I gave up trying to have a decent hairstyle around here. The wind makes it impossible. Ein super süßer Look und ich liebe diese Schuhe 😍😍 das Hemd steht dir hervorragend. This shirt is really gorgeous and unique! Love the entire outfit, very stylish! Such a great look! I really love this blouse!